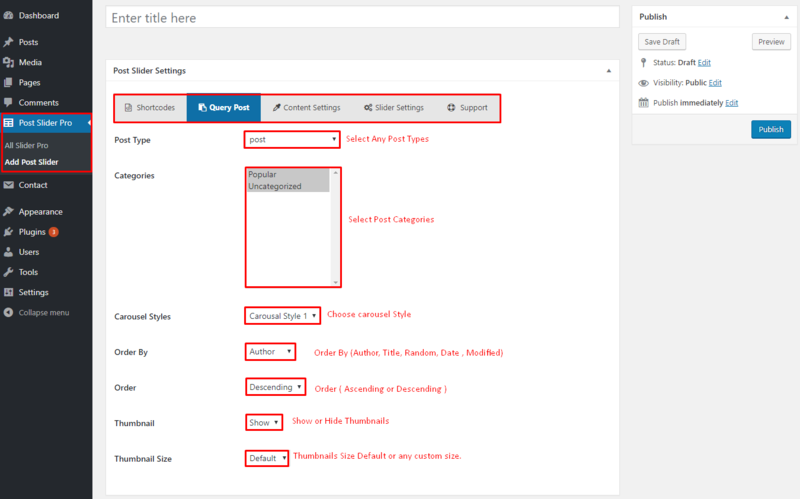 In WordPress Admin click Post Slider Pro menu. You will be taken to the All Slider Pro page. Then click Add Post Slider. When page reloads your post slider all fields will appear. Now fill all data and publish post slider pro. First You need to go to Query Post tab then select a post types under the (post type) then select at last one categories. if you don’t select any categories it not display your post. then fill the other option and publish post slider. Post Type : You can select any post type using this options. Categories : when you select any post types then categories is visible so first select a post types and select categories. Carousel Styles: Carousel Pro comes with eight different styles. you can choose any style via drop-down options. Order By : Carousel display order-by (title, random, modified, date, title) . Order : you can also order your carousel Ascending or Descending. Thumbnail : You can easily show or hide your post Thumbnail . Thumbnail Size: you can use any custom image size or default size.